George Rowe’s bib finished the Falmouth Road on Sunday. He ran in a time of 52:28 which was quite good considering he had died a few months earlier. As for the living, he would have been 8th in his age group (men 60-69), a unsuspecting minute behind the legendary Bill Rogers. In an ideal world there would be no camera pictures of the journey nor rankings on a website. It is, of course, illegal to transfer bibs even to a nephew who wanted to run in his uncle’s posthumous honor. That nephew with George and the rest of his family watched the Falmouth Road Race over the years as it went from a contest between two bars to one of the premier eastern runs. He even wrote a short piece about his mother’s (George’s sister) voyage at the ancient age of 37. They watched Bill Rogers when he was young as he would run by Church Street. They saw Frank Shorter and Alberto Salazar. They saw the rebirth of running. The legends still come back to the race - Joan Benoit stayed with George Rowe a few times before doing the Falmouth Road Race herself, and this year’s african winners looked as fleet as usual. But the race remains more about family lore. A new set of grandkids watched their parents try the thing only to wind up with the same set of ice bags and bandages that they got themselves from to kick a can or capture a flag. The summer was full of the lightly infirmed; bruises are the perpetual souvenirs of summer. The day after the race, the nephew took George Rowe’s grand children on their first distance swim just off shore where the runners traveled. It was the first time that the kids had jumped off of the dock and were a little surprised that you could actually swim in the ocean. “But there is fish and seaweed” they protested. They weren’t natural at it - the grace of swimming comes from repetition - but I would like to think it gave them the taste about going far, how a journey can seem brilliant at first, foolish towards the middle, and finally satisfyingly draining at the end, how worse conditions can mean better stories, and how the best adventures are the ones shared. An athletic life can be a long thing, and my hope is that perhaps one of them will come back sixty years from now and run their own race while the world cheers. And that they will be quite pleased from finishing a minute behind a legend of their own. My only complaint of the day was that my wet suit was too tight. I like to think that in the years since I started doing distance swims that perhaps it was the suit that might have shrunk, but I know that is I who have grown. The suit stays dry for most of the year except for a few summer races. It is in remarkably good shape - the Team in Training logo on the front is still bright and shows little signs of weather, which makes it dissimilar from the person who wears it. A decade has passed since I went to my first information session to learn about Team in Training, a program that prepares novice athletes for endurance events while getting them to raise funds for cancer research. I have gone to Alaska and Hawaii with them. On good days I have ridden my bike or glided on my skis. On a particular bad one I flew out in a helicopter. I have returned every year since 1999 to participate and lately to coach what seems to be perpetually younger people. But that is the same illusion as the wet suit one. The team of marathon runners, humbled by physics of aging knees, is always filled with mostly late twenties and early thirties folk. I am the one drifting away from that mark. When I arrived at the parking lot of Sports Basement, a new team was beginning to prepare for the Honolulu marathon, the same race I did in 1999. I went over to say hello to a few of the coaches I knew before turning towards the Roper Invitational swim registration. A crowd of much older swimmers (the average age seemed to be in the late forties while most of the race staff was older than that) hung around to be body marked and informed of the tides underneath the Golden Gate Bridge. While not as young, the crowd was definitely strong. On the ferry out in to the Pacific ocean I learned about tales of ironman triathlons and death ride centuries. I did chat with a nice couple from England and before I started give them too many tips on how to swim towards Marin I found out that they had each swam the 20 some miles from Catalina to California the week before. The week prior to that the gentleman had swum the English Channel and was being hosted by a woman who swam that straight nine years ago. I am fairly certain that ten years ago I was not expecting such company. We each went to our separate ends of the boat to do a mass jump when the horn sounded. There was an unexpected pause, a brief timeout before the realization that the race had actually started. We then jumped into the Pacific. I did my best to work on the rhythm of distance. The pack of swimmers was mostly in front of me and I drafted while I could. I flipped on my back to sight against the underbelly of the Golden Gate bridge and then returned back to the long strokes. A few hundred yards later, at the middle of the race I came across the same nice British couple and their American host. They were taking photographs of each other. 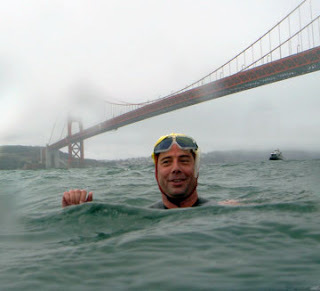 I had a decade of swim times, t-shirts, and towels and the decision whether I wanted to race or linger in the bay which three swimmers and laugh a little was remarkably easy. I asked them if they wanted a photograph of themselves and they kindly returned the favor. The result was better than I expected. Water droplets blur parts of the shot, but you can see the ferry that we jumped from and the path of our journey. The bridge hoovers above and I have a goofy smile from being at peace in the middle of a choppy sea. After ten years maybe you earn a bit of a break. Maybe it was time for an unexpected pause, a great way to celebrate a decade and reflect back toward the distances traveled if only by memory instead of photographs. It was nice to share the drift , because some of the nice parts of exercise are the people you meet along the way. But this can last only so long because eventually the cold of the water catches up with you and the tides must be obeyed. I took in another look and then I wanted to thank the English couple. They, like many of the great aquatic wonders I have seen in my time in the sea, were speeding away in gorgeous effortless strokes as if they possessed a deep sense of porpoise.